Keretapi Tanah Melayu Berhad’s Electric Train Service (ETS) has come up with an innovative programme to encourage more people to travel to the nation’s capital Kuala Lumpur and back without compromising on comfort, time and money. 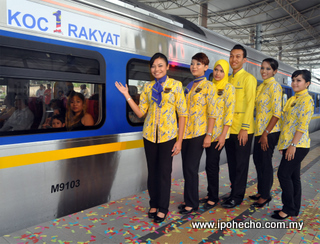 Koc 1 Rakyat, formally launched by Menteri Besar, Dato’ Seri DiRaja Zambry Abd Kadir on Friday, July 29 at the Ipoh Railway station, allows commuters to purchase tickets for as low as RM16 for a one-way journey, Ipoh to Kuala Lumpur Sentral or Kuala Lumpur Sentral-Ipoh. A total of 64,800 seats have been allocated for the promotional period, commencing July 1 to December 31. Thirty seats will be allotted for the ETS Gold and ETS Silver services. However, this privilege is only accorded to Malaysian citizens. Booking can be made online and at the ticket counters, in person with your MyKad as proof. A two-week advance booking is permissible. This is an opportune moment to take advantage of ETS’s promotion before the 6-month period ends. For details on the promotion please call Customer Service at 1-300-88-5862 or visit www.ets.train.com.my.